Councillors have agreed to "plan for the worst" by approving a council tax hike of 4.99% to help plug a funding shortfall of £65m. West Sussex County Council approved the rise - the maximum permitted without a referendum - with 42 votes out of 59. Leader Louise Goldsmith said the increase was "not something we undertake lightly". 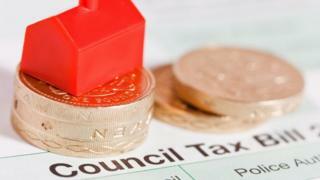 It means council tax bills for a Band D home will rise to £1,384 - an extra £66 a year. The shortfall, it was explained during the meeting, is due to the rising demand for services, a higher-than-average percentage of elderly people, and cuts in central government funding. The tax rise will provide an extra £28m towards closing the gap. The council also agreed on controversial cuts to housing support services, bus subsidies and grants to poorer residents - saving an additional £24m. Councillor Daniel Purchese told the meeting: "This will impact on social care in years to come." The remaining money - about £13m - is being recouped from one-off government grants, and special dispensation to keep a larger than normal percentage of its business rates. Ms Goldsmith said: "Without increasing the council tax, we will not meet our statutory duties. "We hope for the best but must plan for the worst. "For some it will be tough and for others it will be even tougher, so this is not an increase that's been taken lightly but one with a very heavy, however responsible, heart." The 2.99% rise is the largest increase permitted before a referendum is required, the remaining 2% is ring-fenced for Adult Social Care and Health. As well as the revenue budget the council's long-term capital expenditure plans were agreed, including borrowing £26m to complete Woodlands Meed special school in Burgess Hill over the next three years.